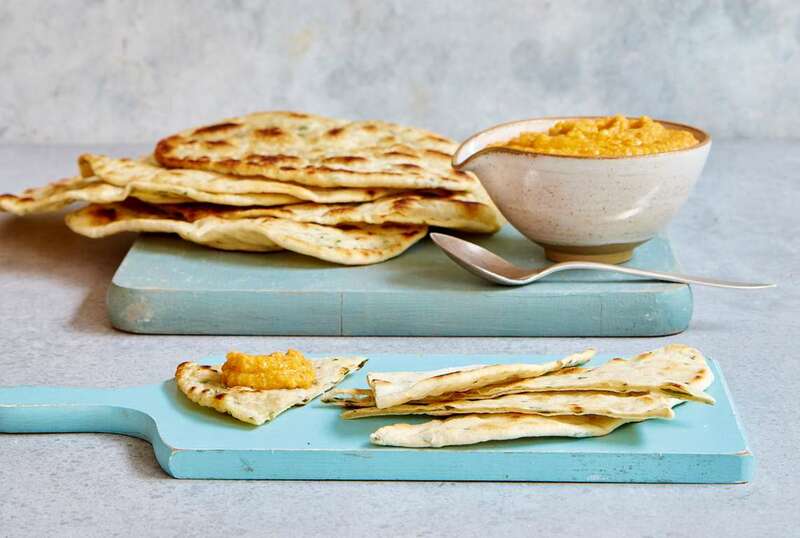 This recipe for delicious spiced carrot hummus dish paired with simple flatbreads is an easy, flavourful vegetarian dish that is great for entertaining. 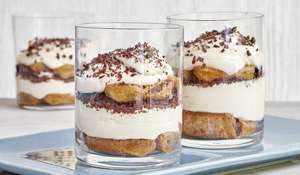 This recipe appears in Mary Berry's BBC 2 series, Quick Cooking. 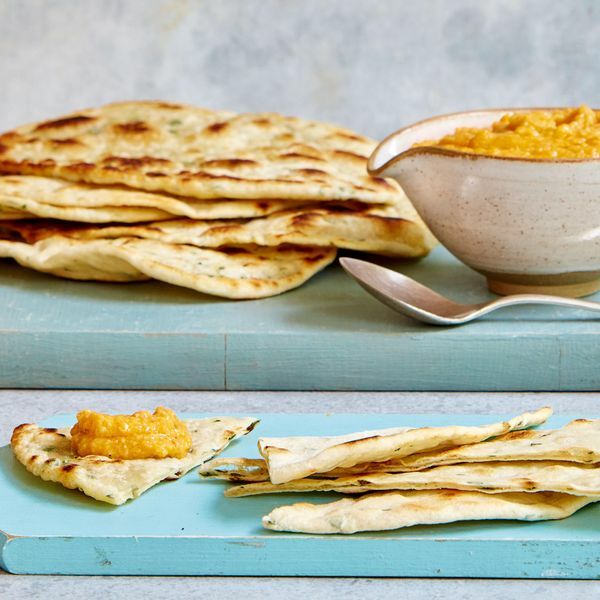 The quickest of flatbreads to make and so versatile too. Perfect for dipping, try them with the Spiced Carrot Hummus or fill with homemade falafel (see page 37 of Quick Cooking) and salad, or your favourite cold meats and cheese as an alternative sandwich. Hummus is always a favourite dip – why not try this slightly different spiced carrot version for a change? You will need: a food processor and a rolling pin. Place all the ingredients in a food processor, season with salt and pepper and whizz until just smooth and creamy (see note). Measure the flour, oil and water into a large bowl and add a good pinch of salt. Mix everything together with a table knife and then use your hands to bring the mixture together into a soft dough. Tip on to a floured work surface and knead for 4–5 minutes. Flatten the dough into a circle, sprinkle over the garlic and herbs and then bring together into a ball again. Knead until the garlic and herbs are well incorporated (see note). Divide into six even-sized balls, then use a rolling pin to roll each one out into a very thin circle on a floured work surface. Heat a large frying pan until it’s very hot (see note), then rub some oil into the pan using kitchen paper. Add one flatbread and fry for 2 minutes until it starts to puff up and turn lightly golden. Use a palette knife to flip over the flatbread and cook for another 2–3 minutes on the other side. Repeat with the remaining flatbreads, adding a little more oil to the pan if needed. 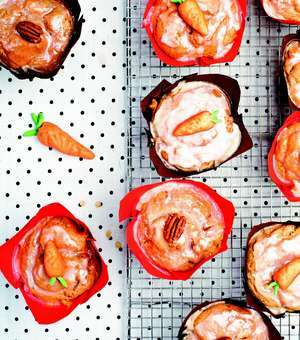 Serve warm with the Spiced Carrot Hummus. 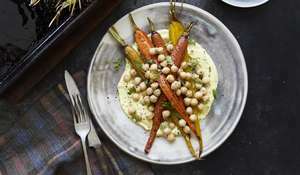 • Do not over-whizz the hummus mixture or the carrots and chickpeas will be too finely ground and may produce excess water, making the hummus too wet. • If you like spiced flatbreads, add crushed spices to the dough too. 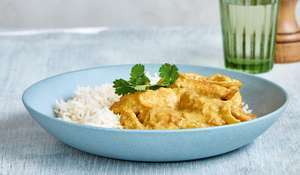 Cumin or caraway seeds or chilli flakes would work well. 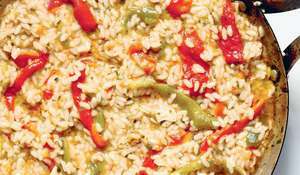 • For best results, the pan needs to be really hot before adding the first flatbread. The hummus can be made up to 2 days ahead and kept, covered, in the fridge. Give it a good stir before serving. The flat breads are best made and served at once. 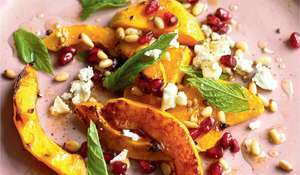 Jam-packed with recipes from the BBC Two series of the same name, Quick Cooking offers up 120 recipes all with Mary's signature flair for reliable, accessible, delicious meals.